I grew up close to Altoona and used to hate all the Boyer products but now I stock up when I take a trip to PA.
I’ve had the Valomilk and thought it was just OK, but like you said neither are really marshmallow. Ooo. Never heard of either one. But judging strictly by appearances, I’d choose Valomilk. Why? Because wavy edges are cool. Is this an actual icecream or a just a chocolate covered marshmallow? 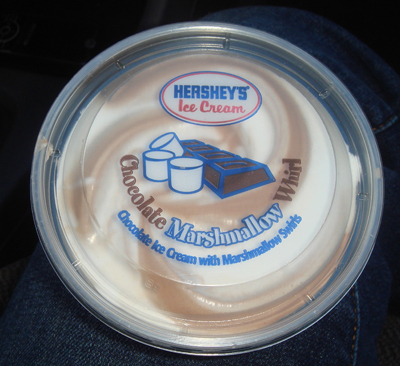 Add me to the list of people who grew up in Altoona, PA and have a fondness for the Mallo Cup. I live in Illinois now, and I always get a kick out of seeing them for sale somewhere here! I’m in love with Mallow Cup but local laws and the fact I eat them so quickly prevent us from marrying. I’ve tried Valomilk and didn’t like it. I haven’t tried Mallo Cups yet but I’m curious to see if I like it more than Valomilk. Bought two package of Valomilks. First package was fine. second package had one piece that was fine and the other was an empty chocoate cup. Looked just fine until I bit into it and it was totally empty. Contacted the company and they said it was impossible to have make a Valomilk with out the marshmallow center. They pretty much called me a liar. I will stick to Mallow Cup from now on. It is much better and much cheaper anyway. Boyer Mallo Cups all the way! Nothing better !! I respectfully disagree…Valomilk blows Mallo Cup out of the water. The chocolate is hand-tempered and incredibly smooth, and the marshmally center is made with real vanilla from Madagascar. The Mallo Cup is not bad in any way, and will do in a pinch, but there really is no comparison. MALLO CUPS ALL THE WAY!!!! The chocolate, and coconut mix is a religious experience. I tried a valomilk once…it tasted like a hot plate of garbarge. The most disappointing candy ever. 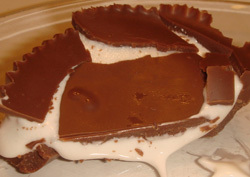 I love marshmallow, and when I bit into a mallo cup it was like having my world shattered. I’ve never had a valomilk, but they dont sound much better except maybe not having the disgusting coconut, I wouldnt be so mad about that, but I hate coconut and its not advertised on the packaging. gross. That Sky bar looks good, but still doesn’t sound like marshmallow. I need to try a Cup-O-Gold I guess, but otherwise the only marshmallow candy I’ve had that was edible are Rocky Road bars. a literal marshmallow bar covered with chocolate and crushed peanuts. Its the best, I can’t believe no one’s mentioned it yet. 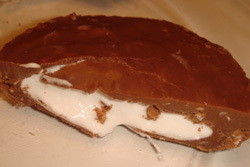 Around two years ago I bought an oblong marshmallow creme candy bar which I believe was made by M&M Mars. I bought a second, and have never seen them since. I always loved Mallow Bars (Never heard of Vallowmilk til now), but they really skimp on the filling these days. Does anyone know of the oblong bar I purchased two years ago? It was the best! It wasn’t a Charleston Chew was it? It’s oblong and kinda tough chewy marshmallow with a thin chocolate coating. Tasty tho. As for my vote I choose Valomilk !! But it has to be fresh. A stale one can be very bad. I grew up in Lewistown, Pa. and the little county store near my house carried these and also Smoothies, their peanut butter cup. Haven’t had one in years but used to buy them all the time. … I think, it depends where one resides and hence, availability. 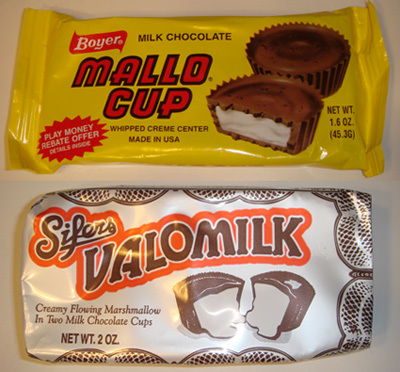 I grew up in NJ where Mallow Cup was prevalent… my favorites were the Sky Bar and the Mallow Cups with the cardboard money. Then, later in life, we moved to Oklahoma, where Mallow Cups, Sky Bar and Chuckles are un available. Here the best is Valo Milk. I love that also… is just best to be open minded and accept the differences, life has to offer.